Upgrading Downtown Burlingame’s existing utility infrastructure is one of Wilsey Ham’s distinguished public infrastructure projects. One of the critical project goals was to ensure services to vital downtown businesses were not interrupted during hours of operation. The project spanned more than nine city streets and has been ongoing for the past several years. 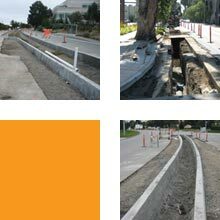 Wilsey Ham designed this street improvement project on Forbes Boulevard, which is one of the main roadways to access the Genentech campus in the City of South San Francisco. The existing configuration of two traffic lanes in each direction, separated by a landscaped median with street lighting, was reconfigured to remove one lane in each direction and incorporate a dedicated bicycle lane. The landscaping and medians were rebuilt and new LED lighting fixtures were installed, as well as additional pedestrian safety features.